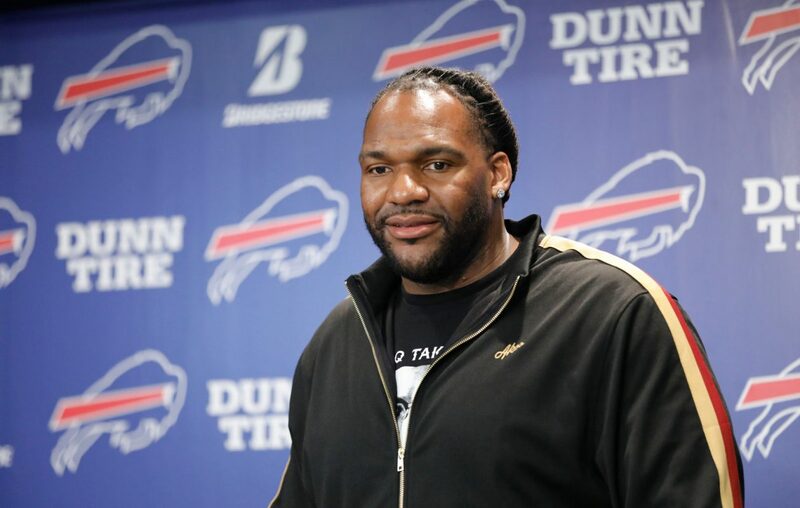 New Buffalo Bills offensive lineman Ty Nsekhe said he has each of the jerseys from the 10 football teams he suited up for displayed in his office. “This one that I’ve got now,” Nsekhe said with a big laugh Thursday upon being introduced at One Bills Drive. Nsekhe hit a free-agent jackpot of sorts by signing a two-year contract with the Bills for $14.5 million and $7.7 million guaranteed. It was a long time coming for a 33-year-old who has spent most of his football life on minimum-salary deals. Consider the pro teams he has signed with since coming out of Texas State in 2009: Corpus Christi Sharks, Dallas Vigilantes, Philadelphia Soul, San Antonio Talons, Indianapolis Colts, St. Louis Rams, New Orleans Saints, Montreal Alouettes, Los Angeles Kiss, Washington Redskins . . . and now the Bills. “Ty had a non-traditional path to the NFL, but it shows you a guy who has persevered,” said Bills General Manager Brandon Beane. It wasn’t until Nsekhe – pronounced In-Secky – signed with the Redskins in 2015 that he finally stuck in the NFL. He was a minimum-salary player for the Redskins from 2015 to 2017. He played last season on a one-year deal for $2.9 million as a restricted free agent. A strong showing in five starting assignments in 2018 caught the Bills’ attention. The 6-foot-8, 330-pounder didn’t allow a sack and gave up just five hurries in 195 snaps at left tackle last season for the Redskins, according to Pro Football Focus. It included an impressive showing against Houston Texans edge rusher Jadeveon Clowney in Week 11. Nsekhe also played 143 snaps at left guard. Overall, he played 40 percent of the Redskins’ offensive plays. Where does Nsekhe fit with the Bills? His contract suggests the Bills consider him a strong candidate to start at one of the two tackle spots. Dion Dawkins is the incumbent left tackle. Tackle is prime position of consideration for the Bills early in the NFL Draft. Nsekhe allowed five sacks in 2017, according to Pro Football Focus, while playing 30 percent of the snaps for the Redskins. In 2016 he allowed just one sack while playing 36 percent of the snaps, all at tackle. What does Nsekhe think about finally becoming a free-agent prize?